In December, Lea Davis, the Human Resources Manager at Triumph Fabrications-San Diego reached out to St. Madeleine Sophie’s Center (SMSC). Triumph Fabrications is a local manufacturer of complex aerospace components. Mrs. Davis explained that Triumph Group, Inc. encourages each of their individual companies to contribute to and support their local communities. 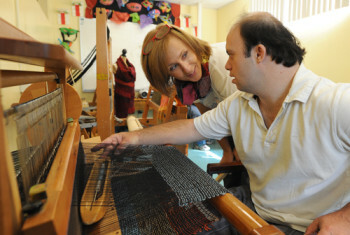 This year, SMSC was chosen as the beneficiary of the Triumph Fabrications – San Diego’s service project. When asked how St. Madeleine’s was chosen, Mrs. Davis explained that SMSC was nominated by one of Triumph Fabrications – San Diego’s employees and Mrs. Davis said she often sees our buses around her neighborhood picking up students. After touring the Center, Triumph Fabrications – San Diego’s Community Project Assessment Team selected several projects that would enhance the campus for our students. 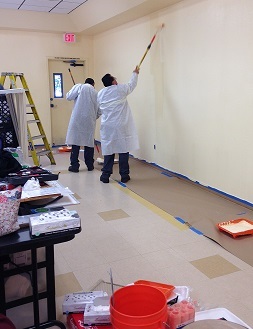 The first was to repaint our multipurpose room. On February 8th, twelve Triumph Fabrications staff arrived at 7:00 am with all the equipment and skills necessary to repaint our 2,700 square foot multipurpose space. In less than 5 hours, the entire project was completed; this included the walls washed, tape along the door way removed, and furniture returned to its area. 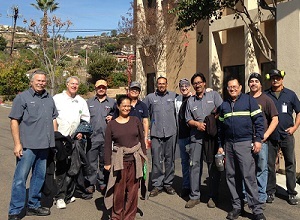 We would like to express our sincere gratitude to the Triumph Fabrications- San Diego team and to Mrs. Davis for her efforts in coordinating this event. Their generous gift of staff time, talent, and materials saved St. Madeleine’s thousands of dollars and that was just the beginning. The group expects to return this month to start beautifying a garden space that will include a water fountain and pergola. If you have any interest in volunteering, or know of someone who might want to volunteer his/her time to complete a project at St. Madeleine Sophie’s Center, please contact Jessica Dolliver, Volunteer Engagement Coordinator at jdolliver@stmsc.org or 619-442-5129 ext. 333.